Peter Lloyd is here to tackle the controversial topics in this fearless – frequently hilarious – bloke bible. 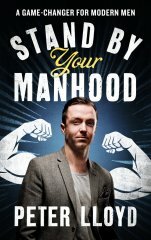 Part blistering polemic, part politically incorrect road map for the modern man, Stand by Your Manhood answers the burning questions facing the brotherhood today. This is the book men everywhere have been waiting for. Peter Lloyd is a London-based journalist who contributes to The Guardian, the Mail on Sunday, MailOnline and the Daily Telegraph. Originally from Liverpool, he was formerly the staff writer at Madonna’s UK PR company. He also worked as a freelance copywriter for Simon Fuller’s 19 in Manhattan, New York. [An] angry, funny, provocative book [that] certainly offers plenty of food for thought. A sophisticated tome for the modern man. His entire book is a call to arms for men to celebrate, acknowledge, and take pride in themselves as men.